A few weeks ago I received a great cookbook to review. It is called "Cook Yourself Thin Faster: Have Your Cake and Eat It Too with Over 75 New Recipes You Can Make in a Flash!". I have really enjoyed going through all of the recipes in this cookbook. They all sound so good. This cookbook has so many great recipes for Breakfast, appetizers, main courses, sides, soups, salads and desserts. What I really love about this cookbook are the pictures of the food. Many of the recipes are pictured so you know exactly what they should look like. Click here if you are interested in getting yourself a copy of this book. This is a description of the cookbook. "Discover what everyone is talking about: the easiest, most enjoyable way to lasting weight loss. Following the smash hit original comes this brand-new collection of over 75 even easier recipes, plus smart cooking tips and real-life success stories. Finally, a diet to savor . . .
What are you waiting for? 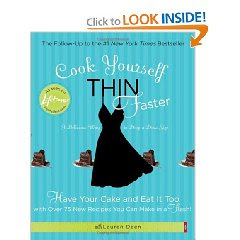 Cook Yourself Thin FASTER!" One lucky Pudget reader will win a copy of Cook Yourself Thin Faster! 1. Leave me a comment telling me your favorite cookbook. 4. For a fourth entry add my button to your blog and leave the link below. Winner will be chosen using a random number generator. All entries must be received by Thursday, February 4, 2010 at 11:59 CST. The winner will be announced Friday, February 5, 2010.
recipepuppy.com is my favorite go-to for cooking! I love the Hungry Girl cookbook. Got it thanks to your reviews. My favorite cookbook is Better Homes and Gardens. I like allrecipes.com and I also have a cookbook from my grandma's church. White Oak COB. It is a huge church, so there are lots of recipes to choose from!! Wow, that cookbook sounds great! Enter me please. I am a follower! My favorite cookbooks are still the old Susan Power cookbooks (Hey Mom: I'm Hungry and Come On America Let's Eat). I don't like my cookbooks. I think its because my last cookbook purchase (a back ordered copy of a Rachel Ray cookbook) was a major disappointment (DH hated every recipe I even had him read). So I haven't bought a hard copy of a cookbook in almost 3 years. I need to get out more. I will claim my copy of Taste of Home's The New Potluck cookbook is my favorite. Cause its got pretty pictures. Not that I have made a majority of the recipes in there, but they all look yummy. I head to foodnetwork.com for most of my recipe needs. That cookbook looks amazing! favorite cookbook is the better homes and gardens one - every single thing I've cooked out of it has been good! My favorite cookbook of all time is The Yellow Farmhouse Cookbook. Love it! I like the first Cook Yourself Thin cookbook. I love all the clever substitutions. Would love to win the new one! My fav cookbook right now is The Biggest Loser Family Cookbook. I love the Hungry Girl cookbook plus I like to search blogs to find good foods.